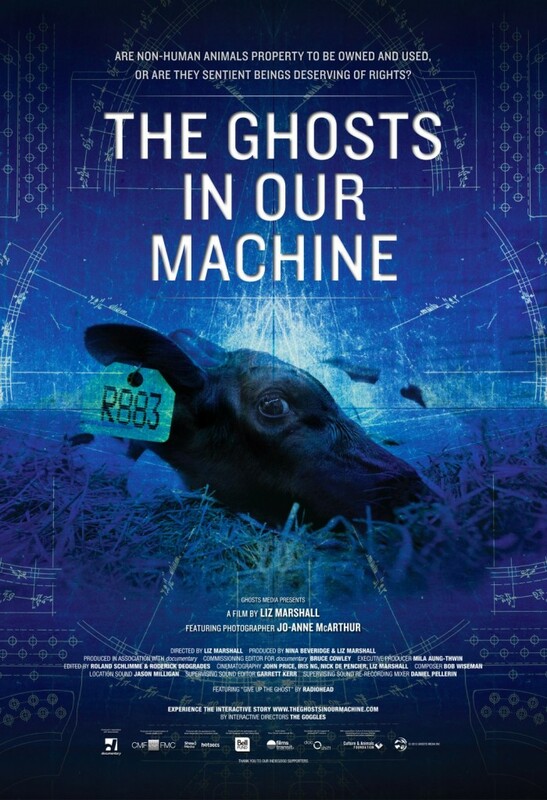 “I feel like I’m a war photographer,” says Jo-Anne McArthur early in The Ghosts in Our Machine, a powerful documentary that follows her for a year as she uses her lens to bear witness to the exploitation of nonhuman individuals for food, fashion, and research. Happily, TGIOM juxtaposes this war on animals with the lives of many who have been rescued—ambassadors for the “ghosts” who go unseen in slaughterhouses, fur farms, and research labs. After premiering in Toronto last spring and being screened throughout Canada, the film makes its U.S. theatrical debut in November in Boston, Los Angeles, New York, San Francisco, and other cities. Director Liz Marshall frames TGIOM around Jo-Anne’s journey as she captures devastating still images of cruelty, heals the emotional wounds she experiences from her work by visiting Farm Sanctuary in upstate New York, and develops the soon-to-be-published book of her photographs, We Animals. Along the way we meet a couple who adopts two beagles saved from research labs, and learn about some of Farm Sanctuary’s residents from the shelter’s director, Susie Coston, who introduces us to cows Fanny and Sonny, a bandaged turkey named Boydstun, and a family of adorable pigs, all of whom will live out their natural lives in peace. What makes the film especially compelling, I think, is that it covers so many issues related to animal exploitation and does so without hitting viewers over the head, often letting the animals speak for themselves. It is mercifully light on graphic images (though they’re not entirely absent), instead focusing on Jo-Anne’s use of photographs as activism. It’s remarkable how much impact her photos can have, especially when you see the context in which they were shot. TGIOM also highlights some of Jo-Anne’s other activism, including humane education and demonstrating with her local group Toronto Pig Save, and we hear from many of the leading voices in the animal rights movement today, including anti-captivity advocate Lori Marino; Theodora Capaldo, president of the New England Anti-Vivisection Society; and Bruce Friedrich, senior director of strategic initiatives for Farm Sanctuary. As well as being an inspiring film, The Ghosts in Our Machine is augmented by terrific music (original score by Bob Wiseman), imaginative editing (by Roland Schlimme and Roderick Deogrades), and beautiful cinematography (it was shot by Nick de Pencier, John Price, Iris Ng, and Liz herself). I hope you will take time to watch it and share it with family and friends. Personal note: I am so proud that the cover of my new book, Bleating Hearts, features a photograph by Jo-Anne McArthur.